threshing1, originally uploaded by jahansell. 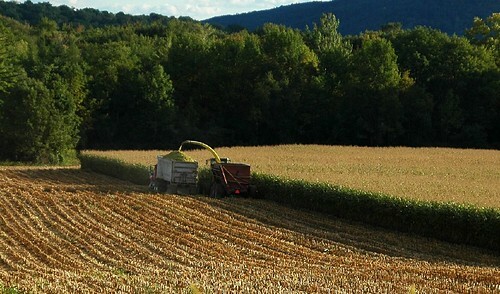 After a bit of research, I learned that the machine on the right is a combine, and it's threshing the cornstalks - grinding them up and spewing them out that top spout into the truck next to it. You can't tell teh size from this faraway shot - the truck is the size of an 18-wheeler! This field is huge - it was 6:30pm when I took this picture, and they had clearly been at it all day with far to go. Just another sign of the changing seasons. I've seen similar combines over here. You certainly have some wonderfully scenery. This picture and the one from the day before really capture the essence of Autumn, my favorite season!